Need Glass? Let Window Medics Come To The Rescue While Saving You Up to 50%! When you have cracked or broken glass in your windows you need to deal with it as a matter of urgency. If you need glass replacement we will send someone out to replace the glass for you right away. Staying Comfortable and Green With Double Pane Glass. Wide Array of Glass Options for Triple Pane Glass. No matter what type of window you have, we can repair it. Whether it is single pane, double pane or triple pane, large or small, our technicians have the skill and expertise to fix it for you on the spot. We have a huge range of glass of all types available. 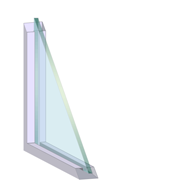 When we repair double pane windows we use low emission glass and the two panes are separated by a gap which we then fill with air, or argon or krypton gas. This gives you maximum insulation and reduces the transfer of temperature between the two panes, ensuring that the temperature inside your room remains constant. You keep the heat in during winter and, if you are using air conditioning, keep it out in the summer. Of course, you will also save money on your electricity bill. 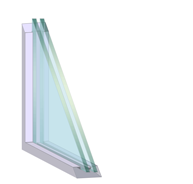 We have several different options available which can be up to 83% more energy efficient than single pane glass. 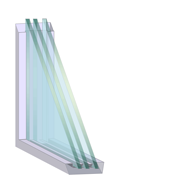 Both double pane and triple pane windows will reduce your energy costs, of course, but the additional benefit is that they will greatly reduce noise penetration from outside. This is especially valuable if you live somewhere that is subject to constant traffic, or near an airport, for instance. Window Medics can also replace glass in your bathroom, such as a shower or bath enclosure. We will design, supply and install a shower enclosure in a variety of options such as satin deco, ultra-white, or tinted in various shades to complement your bathroom colour scheme. If you opt for a framed shower enclosure we have a range of frame designs available from which to choose. The glass that we use is tempered glass which is resistant to the scratching and staining that often affects ordinary glass shower enclosures. Whatever your glass replacement requirements, Window Medics is your ideal choice of supplier. You can call us on 514-600-6568, use the Contact link above, or email us at info@windowmedics.com.